Grandhotel Giessbach is a stunning oasis, a harmonious retreat for its array of guests who enjoy the sweet pleasures of nature’s splendor and serenity. Dating back to its construction in 1822, the hotel offers an unparalleled historic legacy within Brienz, Switzerland, with close proximity to popular destinations, from Bern to Zurich. Visitors can delight in stunning waterfalls, a reflective lake, and the sprawling Swiss countryside ahead of them throughout their travels. While onsite, guests can indulge in the property’s elegantly appointed 65 rooms and 5 suites, enjoy a performance in the elegant venue hall, or relax and look out onto matchless views of Giessbach Falls from the splendid Park Restaurant. With an endless variety of activities amid a picturesque ambiance, Grandhotel Giessbach promises memories that will never be replaced. 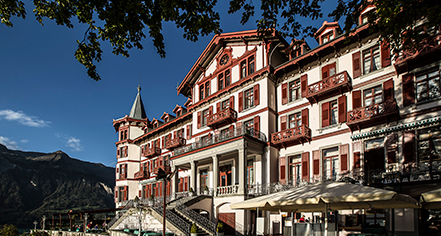 Grandhotel Giessbach, a member of Historic Hotels Worldwide since 2014, dates back to 1822. Grandhotel Giessbach was threatened with closure in 1978, when it was miraculously saved by famed ecologist Franz Weber in 1983 and put under orders of preservation from his various foundations. Hotel/Resort Fees & Taxes: A tax is imposed by the city: CHF 2.00 per person, per night. Payment: All forms of payment are accepted. Payment is required at time of booking. Visa, MasterCard, Amex, Maestro, and Diners Club are accepted. Pet Policy: Service animals allowed: Yes Pets allowed: Yes. Shuttle Service: Shuttle service may be scheduled through the resort's concierge. Rates apply. Smoking Policy: Designated smoking areas. Grandhotel Giessbach is a stunning oasis, a harmonious retreat for its array of guests who enjoy the sweet pleasures of nature’s splendor and serenity. 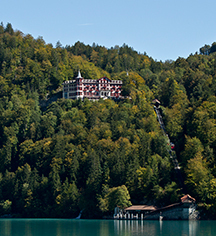 Dating back to its construction in 1822, the hotel offers an unparalleled historic legacy within Brienz, Switzerland, with close proximity to popular destinations, from Bern to Zurich. Learn more about the History of Grandhotel Giessbach .